This instrument would originally have had two folding cover leaves to enclose the central box. One of the covers has been lost, as has the compass from the central box. The surviving features of the compendium include an inclining sundial, a lunar volvelle and aspectarium, and a table of latitudes. Unusually, the instrument is also accompanied by a loose plate which carries a simplified form of astrolabe. One striking feature of the lettering is that each 'N' on the instrument is reversed. 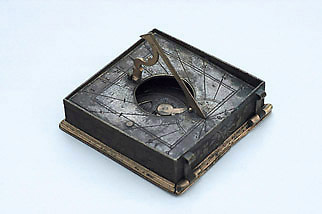 Ulrich Klieber is a well-known Augsburg maker and the instrument is signed by him in two places, as 'KLEBER 1555' on the sundial plate and in a longer inscription on the table of latitudes as 'GEMACHT . ULRICH KLIBER . ZVO . AVGSPVRG . HAT 48 . GRAT'.